When people talk about Florida, they often talk about South Florida’s culture, the Southwest Gulf Coast’s beaches, Central Florida’s theme parks, the state’s five cruise ship ports, the legendary Space Coast or the various sports venues but there is a special part of Florida that may very well be its best keep secret – Pensacola and the Northwest Florida Panhandle. It is a place of incredible natural beauty, modern amenities, historical heritage, culture and wonderful southern charm. Few people know that Pensacola is home to the first European settlement in what is now the United States. Pensacola was founded several years before St. Augustine, Florida but the settlers abandoned the area after a devastating storm. In its colorful history, Pensacola and its bay have been ruled by Spain, France, England, the Confederate States and the United States. With the emerald green warm waters of the Gulf of Mexico and some of the finest baby powder, white sand beaches in the world, Pensacola and the Northwest Florida Panhandle are a beach lover's paradise. There is no other place in Florida like the Florida Panhandle and there is no other place in the Panhandle quite like Pensacola so we have gathered together our Discover NW Florida and Pensacola Area Favorites. If you love historic theaters as much as we do, you have to catch a show or concert at The Saenger Theatre. This Spanish Baroque/Rococo style theater opened in 1925 and hosted vaudeville and silent films. Today, after a $15 million renovation and expansion, The Saenger Theatre is known as “the premier performance space on the Gulf Coast” selling $2.5 million in tickets annually. The Saenger Theatre hosts an eclectic variety of shows such as the Pensacola Symphony Orchestra, Harry Connick Jr., David Copperfield, John Tesh, Wynton Marsalis, Ziggy Marley, CATS and Sesame Street. We attended a performance of Smokey Joe’s Café with the Coasters and enjoyed every minute. Visitors can tour the fully restored Keepers' Quarters from 1869 and search for souvenirs at the gift shop. Adventurous visitors are invited to climb the 177 steps to the top. Interested in a Ghost Hunt? The Travel Channel and SciFi's Ghost Hunters have both visited the Pensacola Lighthouse & Museum. It has been called one of the most haunted lighthouses in America! * The 1890 Lear-Rocheblave House - a middle-class family home from the late Victorian Period of 1890-1910. It was once owned by Benito Rocheblave, a tug-boat captain. Eight hundred thousand visitors a year cannot be wrong! Nearly a million people visit the National Naval Aviation Museum every year for good reason - it is a world-class attraction of more than 150 beautifully restored aircraft representing Navy, Marine Corps, and Coast Guard Aviation displayed inside the Museum’s 350,000 square feet of exhibit space and outside on its 37 acres of grounds. Visitors can "Soar with the Blue Angels in the dazzling seven-story glass and steel atrium that showcases four A-4 Skyhawks in a diving diamond formation. Enjoy free guided tours and retrace the NC-4’s first flight across the Atlantic. Fly in one of our full motion simulators or see The Magic of Flight, our own IMAX® film projected on a seven-story high screen and feel like you’ve had a bonafide ride with the Blue Angels. Enjoy a delicious lunch at the authentic Cubi Bar Café, decorated with more than 1,000 squadron and unit plaques reassembled from the historic Officers’ Club at Cubi Point in the Philippines. The Museum’s West Wing is devoted almost exclusively to World War II carrier aviation and showcases a full-size replica of the aircraft carrier USS Cabot’s island and flight deck. Famous World War II aircraft such as the Corsair, Dauntless and Hellcat stand nearby ready for take-off, while other magnificent birds fly overhead. Strap into one of the many cockpit trainers for pretend test flights or try your hand at defending a ship from Cabot’s anti-aircraft gun battery on the Main Deck. " In 2008, the Pensacola Bay Area was featured in "The World's Best Diving & Resort" edition of Sport Diver magazine. Fort Pickens is the largest of four forts built to defend Pensacola Bay. The fort was begun in 1829 and completed in 1834. It was named in honor of Major General Andrew Pickens of the South Carolina militia who fought in several Revolutionary War battles. Fort Pickens was one of only four forts in the South that was never occupied by Confederate forces during the Civil War. We enjoyed touring the rooms, climbing to the top of the defensive walls and exploring the gift shop. Originally built in the early 1900s as City Hall, the Spanish Revival style building now offers three floors of exhibit space. The first floor highlights archaeology and the history of Pensacola. The second floor houses rotating exhibits, such as the Wentworth Gallery. The third floor displays traveling exhibits. The Florida Panhandle and Pensacola Bay Area offer a unique and eclectic blend of delicious food choices. Whether you enjoy waterfront dining, flip-flop casual dining, Southern BBQ, fresh seafood or gourmet dining, you'll find it here. Some of our favorites include - Global Grill, Jackson’s Steakhouse, The Grand Marlin, and Bud & Alleys Seaside. You just cannot talk about the Florida Panhandle and Pensacola without highlighting these gorgeous beaches! 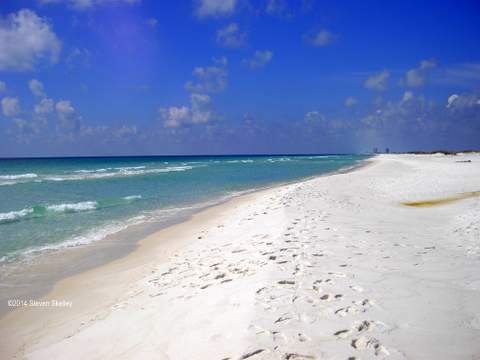 With the emerald green warm waters of the Gulf of Mexico and some of the finest baby powder, white sand beaches in the world, Pensacola and the Northwest Florida Panhandle are a beach lover's paradise. Pensacola Beach is located on Santa Rosa Island, one of the longest barrier islands in the world. It has been named among the nation’s top 10 beaches by TripAdvisor. The 1,471 feet long Pensacola Beach Pier is one of the longest in the Gulf of Mexico. Florida has some of the most beautiful beaches in the world and Pensacola has one of the most beautiful beaches in Florida. Pensacola in Northwest Florida is a fantastic blend of incredible natural beauty, modern amenities, historical heritage, culture and wonderful southern charm.